Who guides the Wildlife Collision Prevention Program? The Wildlife Collision Prevention Program is a program of the British Columbia Conservation Foundation, a federally registered not-for-profit organization, dedicated to the conservation and stewardship of British Columbia's ecosystems and species. 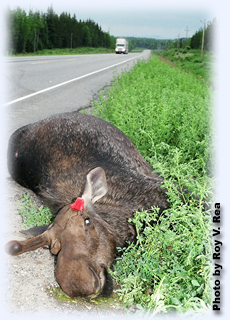 Why is the British Columbia Conservation Foundation involved with wildlife vehicle collisions? The British Columbia Conservation Foundation has a long history of contributing to worthwhile conservation projects in B.C. Losing thousands of animals to vehicle traffic every year is unacceptable when there are opportunities to help prevent and reduce this problem. What does the Wildlife Collision Prevention Program do? How can I donate to the Wildlife Collision Prevention Program? The Wildlife Collision Prevention Program offers benefits and rewards to its corporate sponsors. For details, see the WCPP newsletter. [PDF - 789 KB] To explore corporate partnership or sponsorship opportunities, please visit the You Can Help - Corporate Sponsors page and contact us. Your donation will be used to support research and implementation of wildlife vehicle collision prevention techniques and continued public awareness and education. Is there other funding for the Wildlife Collision Prevention Program? The Wildlife Collision Prevention Program has numerous partners, which provide support, both financially, and with "in-kind" contributions. Why do all this research if we know that fencing works? If erected and maintained properly, fences can virtually eliminate wildlife vehicle collisions. However, there are strong biological arguments against extensive fencing. Traditional wildlife movement corridors are interrupted, wildlife habitat is fragmented, and there is evidence to suggest that predators can use fences to increase their hunting success. Fencing is an expensive method of accident mitigation. It costs between $40,000 to $80,000 per kilometre to fence both sides of a highway. Additional fence maintenance costs are also significant.